The US strong economic reports increase the possibility of Fed’s rate hike. Considering the last days of month, traders may see a lot of volatility. 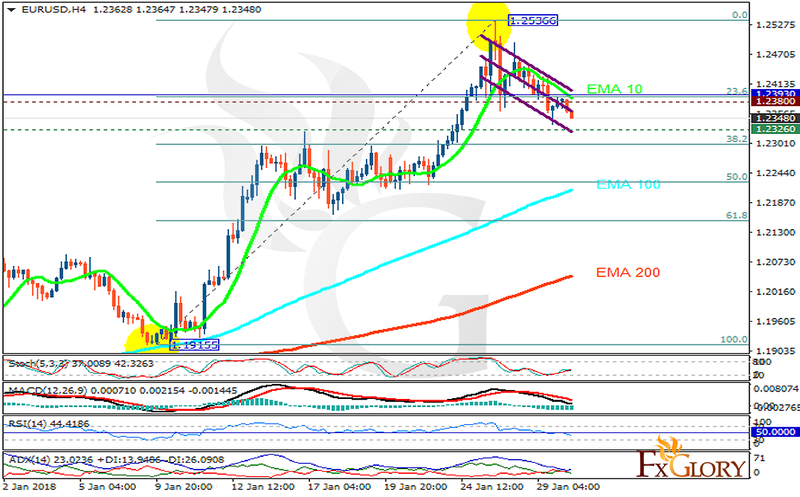 The support rests at 1.23260 with resistance at 1.23800 which both lines are below the weekly pivot point at 1.23930. The EMA of 10 is moving with bearish bias in the descendant channel but it is above the EMA of 200 and the EMA of 100. The RSI is moving below the 50 level, the Stochastic is moving in low ranges and the MACD line is below the signal line in the negative territory. The ADX is showing sell signal. The pair may fall towards the 61.8 level of Fibonacci to form the correction pattern in long term, however, short term traders can target 1.22.